January 2009 – Planet Geek! Grow Tower – Here we go again! Because you obviously had too much spare time. Grow Tower is now up for your Grow pleasure. My best while tinkering this morning is 14, but already the animations make me want to try for higher. That was a great day of skiing. 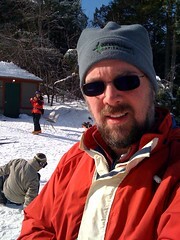 This was yesterday (Saturday), up at Wachusett Mountain in Princeton, MA. Zach and I went up for a good chunk of the day, hauling our food and other goodies in ourselves (Holy cats is food there expensive. Better to just bring your own). It was by far the busiest day I’ve ever seen there (with weather today forecast to be in the single digits, and it was), so naturally most of the east coast went skiing on Saturday. Lift lines were in the 40+ minute range, which was reminding me of the days we skied at Hunter Mountain in NY. Things sure have changed since then – the lifts are FAR faster, carrying 4 folks per chair, using that ‘zoomie launch’ bit, but the old tricks still work. Zach and I split up and took to the ‘singles’ line, and were able to zip through to the lift in about 10 minutes each run. Wahoo! Zach had all new ski gear this time, after some successful ebay and craigslist scrounging. Didn’t have to deal with rentals at all. Another win. The gear worked great, and we both had a fantastic day. Someone on a chat channel mentioned this site, and I’ve been browsing it off and on over the last few days. The site is TVtropes.org, and is a vast collection of ‘tropes’ found not just in television, but in comics, manga, and film. Tropes are devices and conventions that a writer can reasonably rely on as being present in the audience members’ minds and expectations. On the whole, tropes are not clichés. The word clichéd means “stereotyped and trite”. In other words, dull and uninteresting. We are not looking for dull and uninteresting entries. We are here to recognize tropes and play with them, not to make fun of them. The site has a horrific amount of information on it, in wiki form, though they are careful to state they are NOT wikipedia (“We’re a buttload more informal…”). Marty McFly from the Back To The Future films: “Nobody… calls me… chicken!” This is a rare instance in which getting over the Berserk Button is part of the Character Development, or where the Berserk Button is even treated as a bad thing to have. In Hudson Hawk, when Eddie orders a cappucino, the bartender slides it down the bar to him. Cuz all the k00l kidz are doin it. Are you a Perl geek? We’re looking for you! My current employer is looking for a senior Perl developer. We’re located out in Littleton, MA. Full details of the position behind the cut. Feel free to poke me for any details. We use the standard LAMP (where P = Perl here) stack, in CGI / mod_perl configurations. Hey, this could be fun. I’ve set up a script that watches twitter for the hashtag ‘#arisia’. When it finds a tweet with that in the message, the script retweets the message over to @arisia. So, if you’re coming to Arisia, and use twitter, add @arisia to your follow list, and join the conversations in realtime with your fellow Arisians! To have your tweet show up in the @arisia group, just add #arisia to your tweet. Continuing the ‘home sick during a snowstorm’ thread, today I set up a couple machines in Chez Geek for ripping and tackled my backlog of CD’s from my great cd un-casing. The trick here was to get enough machines running so that I was always ripping music, but not getting too nutty running around to different consoles. After some fiddling, I got 2 grip processes running on ‘yawl’ – one on the external USB cdrw drive, the other on the internal generic ATA drive. The external one ran the fastest, ripping at around 6x times on average. I also ran a grip process on ‘algol’, my laptop. I configured up X so I could display the 3 grip sessions back to algol’s screen, so had a view into how all 3 ripping sessions were running, and settled in to feed cd’s. Total disk space consumed is somewhere in the 2-3 gig range, perhaps 40 albums ripped. ‘yawl’s load average hovered in the 4-4.5 range, and seemed to take just fine to everything I was demanding of it. I’m only about 1/4 of the way through my whole CD collection. 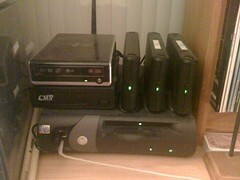 I think next ripping job will involve 2 more machines with better CDrom drives, and then I can really get in the groove. Being home sick makes me turn my attention to gaming. I’ve gotten back into Puzzle Pirates, and that’s been good for multiplayer, general quiet entertainment. I’ve backed off on Eve Online, for a number of reasons (not being home / in front of a windows game machine all the time is pretty key). Last night I decided to do a little more involved gaming on ‘algol’, my linux laptop. HappyPenguin provided a couple interesting options, a few showing up in apt, so I installed one. The problem is, the app I chose (SuperTuxKart), blinks like crazy when running. I’d seen this behaviour in the Compiz / Xscreensaver screens, but thought it was something specific to XScreenSaver’s interraction with Compiz. Alas, that’s not the case. Currently opengl apps do not work correctly when composite is running. This is a BIG bug and annoyance for desktop users, especially as composite-by-default is set to be included for gutsy. This should be fixed via redirected direct rendering. It is especially important as modern applications use opengl interfaces, such as blender and google earth, but also for smaller opengl parts, such as the visualisations in amarok. Users of ubuntu, both advanced users and novices, find it annoying to have to disable the compositioning window manager whenever they want to run an opengl accelerated application. Solving this requires deep changes to the structure of the X server and the display drivers, and is a future plan for the Xorg devs: http://dri.freedesktop.org/wiki/DirectRenderingToRedirectedWindows (A prototype for this has been developed by Kristian Hogsberg: http://hoegsberg.blogspot.com/2007/08/redirected-direct-rendering.html). However, it is a big job, so I believe that the Ubuntu devs should help out. So, if you use Ubuntu and GL apps and Compiz, and you have the blinks, there’s no known fix. I’m guessing it’s specific to certain video drivers, because I know some systems work fine, but on this machine (which uses an Intel 945GM chipset), looks like it’s no GL for me. Well, I’ve gone and done it. Connect away, ya’ll! Still needs a lot of polishing and finessing, but it’s a start. When the workshop is up and functioning at Mosaic this will be one of my first projects. I see it now. I hope I can do half as good a job as this fellow has. Suggestions for Network Filesystem Technology? I’m looking for suggestions on how best to set up filesystem services for my local network. I’ve built out a decent fileserver (‘yawl’, running Ubuntu Linux) with a series of external HD’s, and I want to make those filesystem(s) available to client machines. Per my recent post, I’m liking the idea of using a centralized authentication server for account management. This is the role traditionally filled by Microsoft Active Directory. I have no interest in dedicating a new machine, paying Microsoft money, and introducing a whole new layer of ‘customizations’ to standards, as Microsoft is wont to do. Whatever solution I use needs to provide cross-platform support based on existing standards and tools. LDAP + Kerberos is what I have running now, but I can look at others. I’ll need support for various client platforms. The big three – Linux, Mac, and Windows are a given. I don’t mind needing to install simple tools on each platform (for instance, for Kerberos ticketing on Windows, you need Kfw, etc). I have zero budget for this project, other than hardware. If I’m supporting my half dozen clients initially, with a possibility of a larger deployment later, the solution should be available in opensource. Now, I already hear the cry. “Why not just use CIFS, the ‘windows’ fileshare protocol? Everyone uses it, and Samba is a great system.” That’s because from everything I’ve read, Samba cannot use an external authentication system OTHER than active directory. It vaguely supports Kerberos, and vaguely supports LDAP, but only to the level that an Active Directory server provides. I can find no clear documentation or even loose information that states how to configure Samba to authenticate in a non-windows Kerberos realm. Not a bad idea. SSH is widely supported, well known, and seems like it’d do the job. Unfortunately, the sshfs is a FUSE system, and requires some tweaking on the Linux box to make it work. Secondly, I can find no support for sshfs clients in Windows or Mac. Alas. Ahh, the good old days of NFS. Everyone knows it, everyone supports it, as far as I know, no one really likes it. At least NFS’s weaknesses are well known. In addition, I don’t know how good the NFS client support in Windows and Mac is. So whadya think, world, what should I look at? Is there hope? It’s certainly no secret that I’ve been a KDE fan for ages. I’ve been using KDE as my primary Linux desktop for going on 10 years now. In all that time, I’ve made occasional forays into GNOME, but every time ran in fear at the sheer idiocy of the interface. Either it was too ‘smart’ doing ‘really cool stuff!’ or it was dumbed down to the point where it was impossible to use. A steady litany of “Oh, just edit gconf to fix that” or “you need to recompile such and such a module, that’s been patched” made me run back to KDE’s stable, consistent, powerful interface. Gnome, on the other hand, was delightful. They had finally struck the balance between “make it as simple as you can” and “make sure all the necessary functionality is there.” The package managers are sane and work, the configuration tools are consistent and do the job, the desktop, while sparse, is eminently useful, and it’s fast. I have done 4 Ubuntu 8.1 installations now, and each has gone without a hitch. The only ‘missing’ bit I’ve had to deal with involved a missing package from my first Kubuntu -> Gnome upgrade. This bothers me in a bunch of ways. What happened to KDE? I think it can best be summed up as ‘Gnome grew up’. KDE stayed ahead of Gnome for a decade. It took that long for the Gnome folks to get it together and come up with something that actually works. What I worry about is that didn’t happen through careful UI design and deliberation, but the result of years of trial and error. The fear is that just when they get it right, they’ll either stop working on changes to the desktop (thereby stagnating the environment), or will try more radical ‘upgrades’, breaking things again. Time will tell. But for now, I’m pretty happy with Gnome.